This is the first handbook to cover in detail all aspects of this fascinating field of chemistry. In this handy two-volume set, readers will instantly find the information they need, clearly structured according to the individual metals in the main groups, hitherto only accessible after much time-consuming research. The result is in indispensable aid for everyday work in the lab. 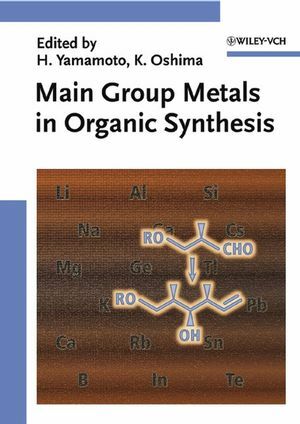 Alongside all the classical organic reactions, this book focuses on the modern variations as well as novel, current reactions in organic synthesis that are closely linked to main group elements - both stoechiometric and catalytic. With this work the two prizewinning editors have succeeded in producing a comprehensive compendium of the main group metals as reagents for organic reactions. In short, this is a must for every organic chemist, whether as an efficient introduction to current research, for retaining an overview or for looking up detailed information. Hisashi Yamamoto (born 1943) start his research in Hitosi Nozaki's laboratory at the Kyoto University, Japan. After obtaining his PhD under the mentorship of Elias J. Corey, he joined Toray Industries, Inc., Japan and then he became instructor and then lecturer at Kyoto University. In due course, he was professor at the University of Hawaii and at Nagoya University, Japan. Eventually in 2002, he became Professor at the University of Chicago. Since 2002 he is Professor at the University of Chicago. Hisashi Yamamoto's work has been widely acknowledged and honoured with several academic awards and honours (e.g. Max-Tishler Prize, 1998, Le Grand Prix de la Fondation Maison de la Chimie, 2001, Tetrahedron Chair, 2002). He is on editorial boards of several outstanding publications inclusive European Journal of Organic Chemistry and Encyclopedia of Reagents for Organic Synthesis. Koichiro Oshima (born 1947) obtained his PhD under the supervision of Hitosi Nozaki at Kyoto University, Japan. He spent two years at MIT as a Postdoctoral Associate in the group headed by Barry Sharpless. At present he is Professor at the Graduate School of Engineering, and his research deals with the manifold use of main group elements in organic synthesis. Koichiro Oshima's work was honored in 1983 with the Incentive Award in Synthetic Organic Chemistry.